• A microscopes best friend: Other than the microscope technician, is the microscope cover. Always cover the microscope with the supplied dust cover when not in use. We cannot stress enough the importance of covering the glass (lenses) of the microscope. Most educational environments do not have the best filtering technologies and covering them protects them from dust in the laboratory. Also cover the micrsocope if they are stored in a cabinet. There is ample dust in cabinets also. Are you having trouble with your microscope? Below is a list of common questions Microscopes America receives when it comes to microscope maintenance and troubleshooting. If your question is not listed here, please call us at 1-800-790-8115 and a microscopetechnician will gladly assist you. 1) My microscope will not turn on or illuminate. • First, check to see if your microscope is plugged in. Ensure your lab station has power. Also, ensure your aperture diaphragm is not closed. If light is not coming through your condenser open the iris or disk diaphragm. • Check to see if the bulbs are installed correctly: You may have to install or reinstall the microscope bulb. Not all microscopes are shipped with the bulbs already installed. If the bulbs are installed, check to ensure they are not loose, which occationally occurs during shipment. • Have you examined all power adjustments? Most microscopes have rocker switches located on the back, sides or the top of the base. Have you checked to ensure the switch is turned on. Ensure once the microscope is turned on, and you have power, the dimmer (rheostat) is turned up. The dimmer may be turned all the way down. Therefore, no light. • Is the fuse in good condition? Some microscopes (with cords) have fuses that can be accessed from the outside (and sometimes inside) of the microscope. 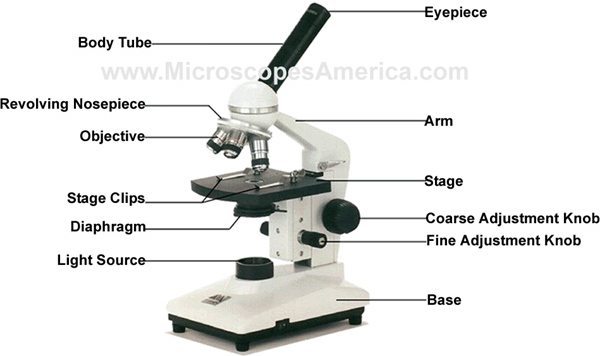 Depending on the your microscope model, you will either find the fuse on the bottom or back of the microscope. If the glass case of the fuse appears discolored or burned, or you can see broken pieces of the fuse element, this means the fuse is not working (the fuse is open). Replacing the fuse will solve your illumination issue. If your microscope blows the new fuse quickly, please contact one of our microscope technicians for a quick repair. FINALLY: If your microscope is turned on. Your microscope has power. Your microscope's diaphragm is open. Your fuse is fine (closed). Then, most likely, you either have an electrical short in the wiring or you may even have a blown transformer (transformers do not blow often and it is rare but it does occur).